Last week I attended a talk by Rob Reeder, a PhD student at CMU, on the $subject. The basic idea behind their (Lorrie Faith Cranor et al.) work was to come up with more intuitive and easier to use interfaces to represent policies for access control (e.g. OS file permissions), privacy preferences (e.g. P3P), etc. Although I am neither an expert in HCI aspects nor working in this area, I found the material very interesting; at the end of the day, success or failure of whatever we invent is judged by the users. Simplicity is the key. A French writer and aircraft designer once said that "A designer knows he has arrived at perfection not when there is no longer anything to add, but when there is no longer anything to take away". Getting back to the problem they were trying to solve, all existing policy representations are basically one-dimensional (take windows file permissions and natural language privacy policies for example) and this may be a potential usability problem. Their solution was to introduce two-dimensional expandable grids to represent the same. The surveys they had conducted showed mixed results. An application for authoring Windows XP permissions. 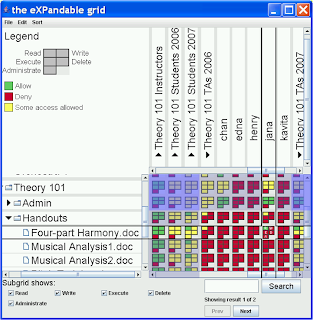 Rows represent files (expanding folders) and columns users (expanding user groups). A cell represents the kind of permissions a user has on a file, a user has on a folder, a user group has on a file or a user group has on a folder (4 possibilities). Their surveys conducted on the above vs. Windows XP permissions representation have shown positive results. Another example was to represent P3P policies. Usually, web sites specify P3P policies in natural language (English) which is quite difficult to follow. Here's a snapshot of their approach. 3. A user need to remember many types of possible symbols that can be applied to policies which are not standardized notations; users simply don't want to go that extra mile to memorize those proprietary symbols just to protect privacy. A standardized set of possible symbols may do some justification. 4. Also the symbols used are quite similar to one another and does not reflect the operations they are supposed to represent. 5. The color scheme used is not appealing to me either. How does their grid scale when there are many X and Y values? What can be done to improve the grid when it is sparse? Can be loaded incrementally to improve performance? How do we represent related policies? How do we systematically convert one-dimensional representation into a grid without loss of information? Although their initial work has mixed success, I think that with improvements there can be a positive impact on not only in OS permissions, policy authoring but also other domains such as representing business rules, firewall rules, web services policies, etc.